The struggle to protect a livable climate is a struggle to see, understand and act on our fundamental interconnections. This is familiar to the climate activist who knows her trips by car connect to the Earth’s atmosphere, which connect to patterns of rainfall decades from now on the other side of the planet. Seeing those interconnections, taking them seriously, and acting as though they are real, meaningful and significant is at the heart of our work, whether it is writing better policy, making different investments, or challenging deeply held mindsets. 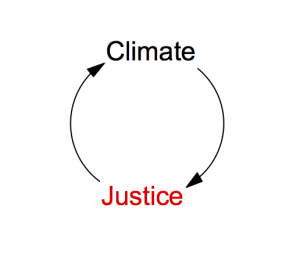 But the struggle to see interconnections and live and act as though they are real and significant is, of course, not limited the climate struggle. For those of us in the United States this week, the verdict of the grand jury in Ferguson, Missouri is making another set of interconnections real for us in our newspapers or, for some of us, in the streets of our cities. The decision to live and act as though interconnections matter can’t be done halfway, if we are sincere about it. If we believe we are connected to the atmosphere and future generations then we are also connected to the young black men of Ferguson. True recognition of interconnection leaves no room to prioritize some connections as of more value than others. The Earth matters, future generations matter, and Mike Brown matters. Any viable solutions to climate change will start with this recognition. At Climate Interactive we are challenging ourselves to think differently about climate solutions. We are pushing ourselves to imagine solutions that arise out of this fundamental sense of interconnection, where success is measured not only in tons of emissions reduced but also in levels of equity reached. We are looking for solutions that will not only allow the mothers of 2050 and 2100 to rest easier but will also ease the burdens of all mothers in all of our communities today. Protecting the climate will always require some attention to counting and reducing tons of carbon, but it also is now asking us also to see our fate linked to the fates of others, and to stand in solidarity with them as best we can. That solidarity will take different forms for each of us, but to take ourselves seriously when we propose drastic measures to protect a river or mountaintop or our great-grandchildren, we need also to be wiling to call for and contribute to drastic measures to protect everyone in our society today. Or for a compilation of groups working in Ferguson and beyond click here. Very good and encouraging article. I stumbled upon this video on youtube about climate change. Is it true that we will be underwater soon?